ROSEBURG, Ore. — A free dental clinic is honoring veterans in the Roseburg area. 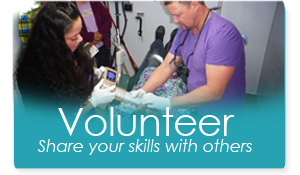 Caring Hands Worldwide is a free dental service that combines volunteer dentists with their portable dental equipment. The clinic is inside a semi-truck. This week they are inviting local veterans to the Turning Point Church parking lot in Roseburg. Dental exams, digital x-rays, cleaning, fillings and extractions are being offered to veterans who do not have dental coverage. Services are by appointment only, and veterans must bring proof of service in the U.S. Military. To schedule an appointment, contact Randy Meyer by emailing Randy@caringhandsworldwide.org.